Having biked to Atwater Village and back for a meeting at The Robert Group earlier in the day, I decided to use my car to go around the neighborhood and post my agendas. So driving south on Heliotrope Drive, right alongside L.A. City College, I followed behind a silver Toyota Highlander who was stopping repeatedly, obviously looking for parking along the street, and obviously someone taking classes at the college. Happens all the time. Not being in a total rush, I waited for the Highlander in front of me to make the turn and find a spot. Eventually, right after Monroe Street, there was an empty curb space (although in hindsight, this is a permit parking area, so a student probably shouldn’t be parking there in the first place). But I stopped, about six feet behind the SUV, waiting for the driver to maneuver into the curb. So, at about 10mph, the driver backed up. And backed up. And backed up. And…BOOM. Hit me right in the front bumper. Agitated, I instantaneously hit my horn and got out. “Did you not see me?” I said to the other driver, who was an older woman. The vehicle that backed up into me. We inspected the respective damage to our cars. Mine had a large paint scratch on the driver’s side of the front bumper, a bent license plate and frame, and an indentation on the bumper behind the upper-right hand corner of the license plate frame. 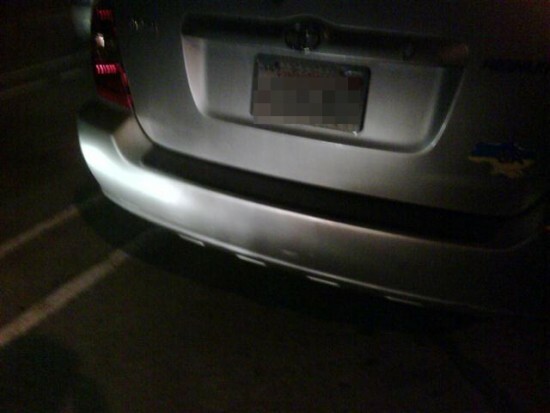 Her car had three barely-visible paint scratches on the rear bumper. She said something to the extent of “I didn’t see you” and motioned that we should get off the road. She made a U-turn and I followed her. But she kept going. 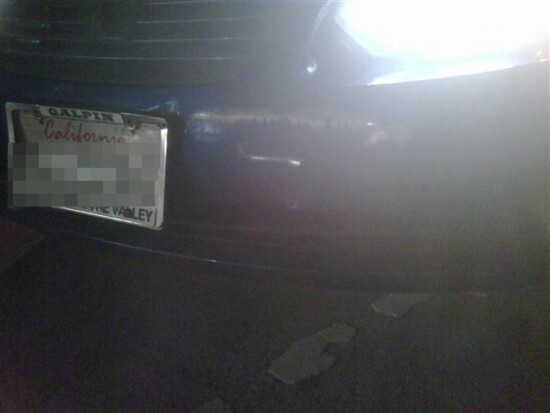 Fearing a hit-and-run, I got down her license plate number and ran after the car. Finally it found a diagonal parking spot over a block away. She asked me where my car was, I mentioned it was parked next to where the accident happened. She asked me to bring up my car, and said she would wait for me. So that I did. We took pictures of our respective damage. “What do you want?” she asked me, Me fearing that she had no insurance and simply wanted to pay me out-of pocket for any damages, which I didn’t know would cost. “I just want your insurance information,” I replied. Fortunately, she produced her insurance info; she was a Mercury policyholder, so we exchanged information. Having gone through this sort of thing before (me being the hit victim always), I did this calmly and professionally; as long as she had insurance, I was cool with it. She mentioned that she was already late for class. When all that needed to be done was done, as I was ready to pull away and continue with my business, she tapped on my window and asked me to pull my car right behind hers, which I didn’t really understand why, but I complied. Her car remained diagonally parked, and I pulled up slightly behind her vehicle. It looked like she wanted to match the points of impact somehow. After that we went on our separate ways. Not wasting any time, once I got back home, I called her insurance company to file a claim.